There were five years between the release of Cyberpunk 2077’s first teaser and the trailer at this year’s Microsoft E3 conference. In between the two videos, CD Projekt RED was essentially silent on how the game would play. That is set to change. Talking to GameSpot in an E3 interview, associate designer Kyle Rowley said the studio would be “significantly more open” between now and release. Though he caught himself before saying exactly when that would be. Rowley clarified to say that the team would, of course, still be keeping elements of the game under wraps. The team don’t want to spoil the story. There is a lot happening this week, keep on top of things with our E3 2018 guide. 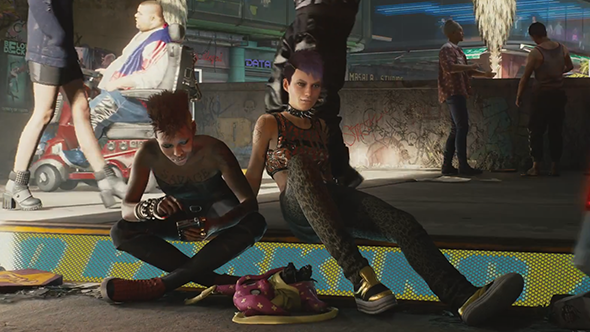 While Rowley stopped short of announcing Cyberpunk 2077’s release date, he did talk about the city’s six unique districts, how the game will feature two different experience systems, and that there will be multiple vehicle types to drive. Including, for the Akira fans, a motorbike – I’m assuming it will be decked out in neon. CD Projekt Red has fostered an amazing relationship with its fans over the years, but particularly in the wake of The Witcher 3. The game was a huge success for the studio, and the team used that success to fund the development of DLC. Now if the team can keep giving interviews like Rowley’s then we’ll be drowing in info about the new game.